and DOEACC CCC level certificate they are only eligible to apply for this Allahabad High Court Stenographer Jobs. 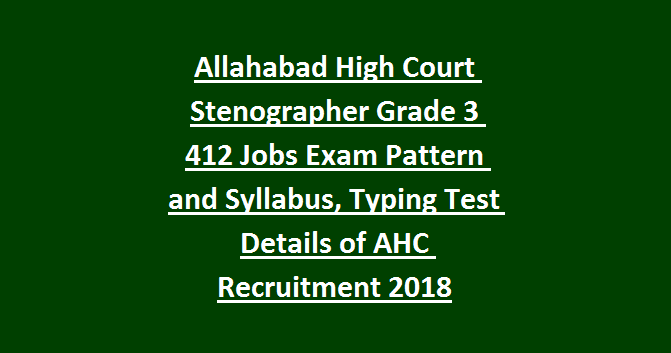 Exam pattern and Syllabus details, Selection process and other information about this Stenographer jobs of Allahabad High court is given below. Selection for this AHC Recruitment of Stenographer will be held in three stages such as Written Test, Computer Type Test and Stenography Test. Complete details of Exam pattern, Stenography Test and computer test details are given below. Degree with diploma in Stenography. Must have qualified CCC certificate issued by DOEACC level. Age limits are 18-40 years for this Stenographer Grade 3 Posts. Written Test will be consists of 100 objective type questions and each questions carries one mark. There is no negative marking. Based marks secured in Written test 1:5 ratio candidates will be shortlisted for next two stage of Computer Type Test and Stenography Test. AHC Recruitment Stenographer Exam duration is 90 minutes. For typing test the candidates will be provided a passage of approximately 250 words for Hindi and 300 words for Computer Type Test, to be typed within 10 minutes on computer for Hindi and 10 min for English on computer. For Hindi Typing Mangal Font will be used on computer. For Hindi Stenography Test- Dictator will dictate the 400 words within the speed of 80 WPM shorthand in 5 minutes. Candidates have to transcribe the dictation with the speed of 30 wpm in 30 minutes. For English Stenography Test-t, the candidates will be given a text of 500 words (with a speed of 100 w.p.m.) in Shorthand dictated in 5 minutes by the dictator. The candidates would have to transcribe the dictated matter with the speed of 40 w.p.m. on computer within 30 minutes. Final merit list will be prepared based on Paper 1 Exam marks, Computer Type Test and Hindi/English Stenography test for these Stenography Grade III jobs of Allahabad High Court Recruitment Exam 2018. Candidates who qualified degree with Stenography diploma they can apply online for this Stenographer posts online from 06-12-2018 to 26-12-2018. Official website ot apply online for this AHC vacancies is http://www.allahabadhighcourt.in/. 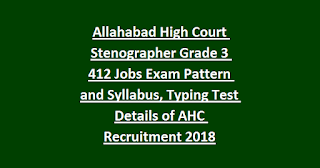 Download Notification here for Stenographer Jobs of Allahabad HC Recruitment Exam.